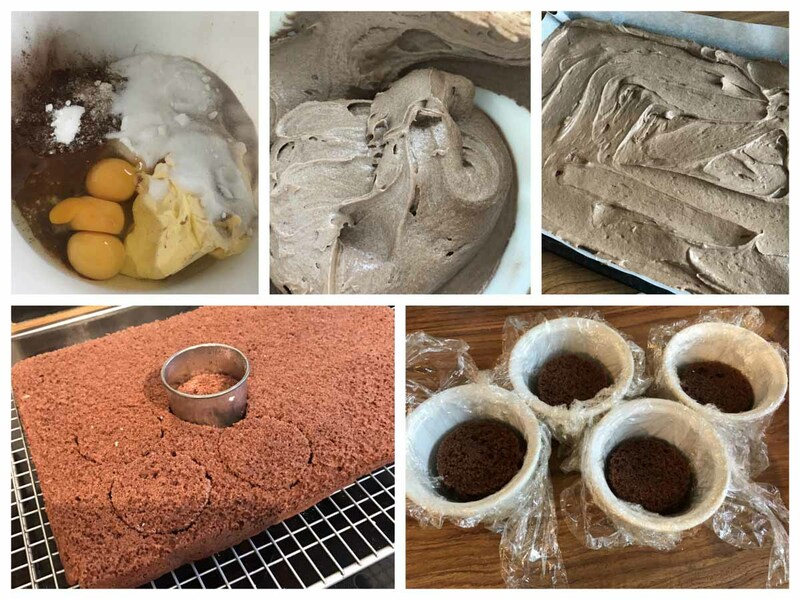 This recipe has been passed on to Helen by her mum Retta who has been making it for years and is a dab hand in the kitchen when it comes to baking. 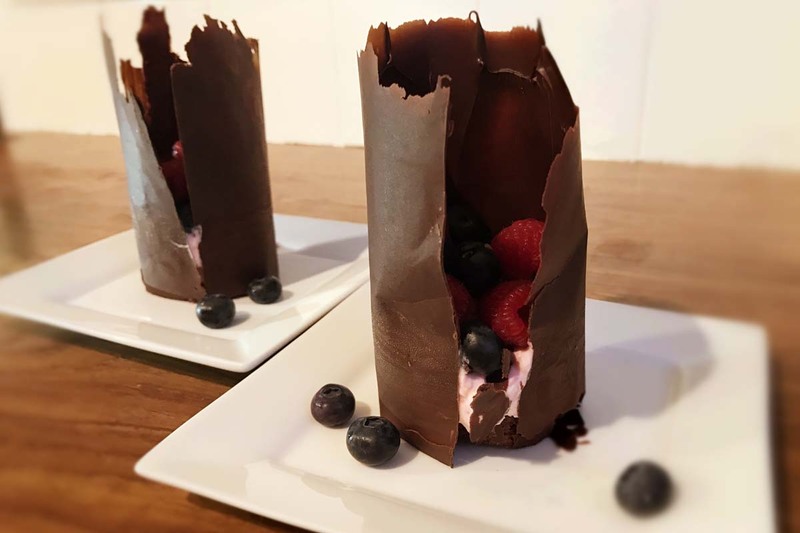 Although the dessert contains dark chocolate and crème de cassis, it is very light and refreshing due to the raspberry mousse and fresh berries. 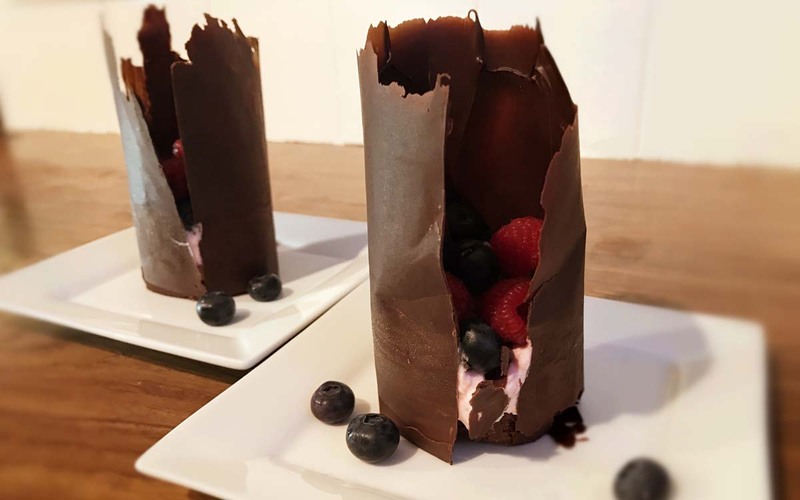 This would be a great dessert for a romantic meal with your loved one on Valentine’s Day, or a dish a that is sure to be a winner should you be looking for something different to serve up to family and friends at your next get together. Pre-heat the oven to 190C and prepare your ramekins. Line 6 – 8 ramekins with cling film, ensuring that you get the cling film into the very base of the ramekin. Beat the flour, chocolate & cocoa powder, margarine, caster sugar, baking powder, vanilla essence and eggs together for about 1 minute using an electric mixer. Once combined, line a baking tray with baking parchment. Pour the mixture into the tray and level the surface. Bake for 15-20minutes in the oven. Once the sponge is baked, set aside to cool. Once cool, cut the sponge into circles to fit in the base of the ramekins. You will have leftover sponge that you can freeze if you wish. Evenly spoon the 2 tbsp of crème de cassis over the sponge based ramekins and set aside. Put the 150g of raspberries and 2 tbsp of crème de cassis into a blender and blend until smooth. Put the icing sugar and cream in a bowl and whip until stiff peaks appear using an electric whisk. 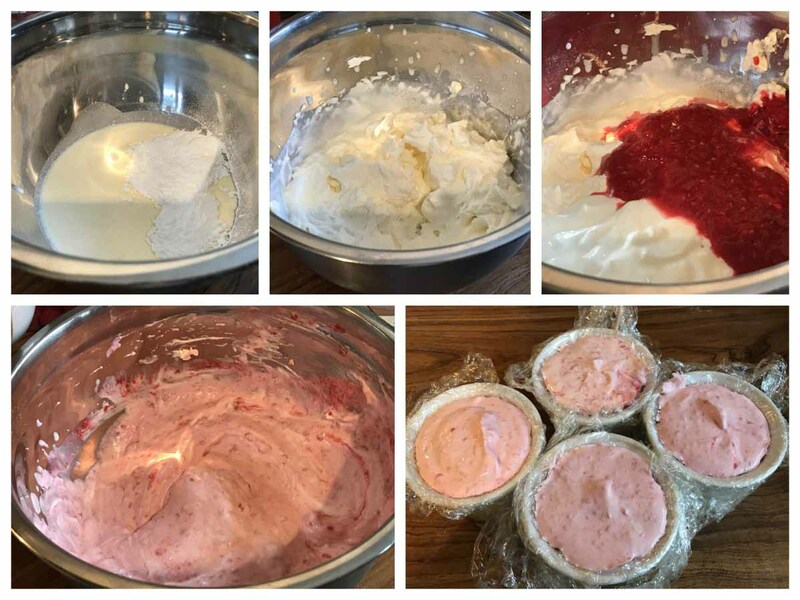 Fold the raspberry purée and fromage frais into the whipped cream mix. Spoon evenly into the ramekins and place in the freezer for 1 – 2 hours. After your mousse has been in the freezer for 1 – 2 hours, begin to melt the chocolate. Melt the dark chocolate in a bowl over a pan of simmering water, ensuring the base of the bowl does not come into contact with the simmering water. Cut some baking parchment into rectangles which are large enough to wrap around the outside of a ramekin. 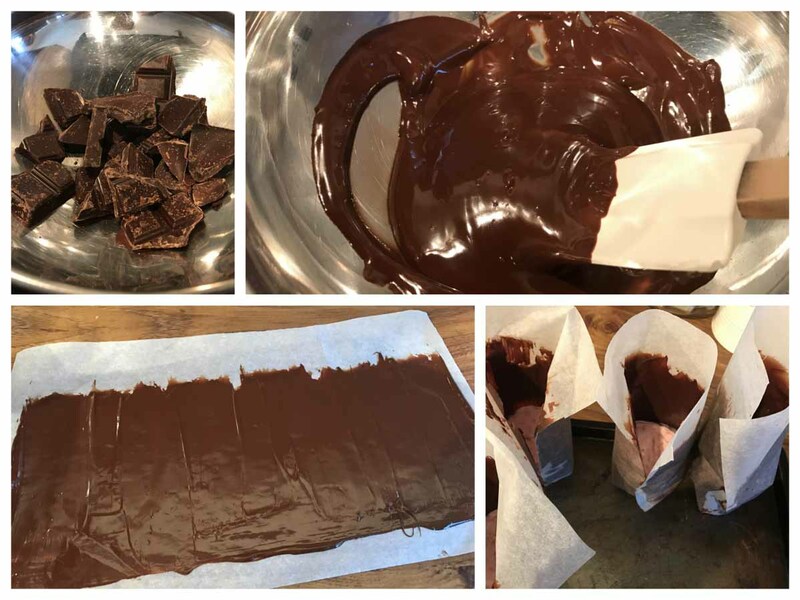 Spread the chocolate onto these baking parchment sheets, ensuring there is a straight edge along the base. Leave aside to partially set for 5 minutes. While the chocolate is partially setting, remove the ramekins from the freezer. Carefully remove the raspberry towers from the ramekins, and peel away the cling film. Set the towers on a baking tray, sponge side down, and wrap the chocolate around the outside of each. After you have wrapped each tower in chocolate, place the tray in the fridge for 10 minutes until the chocolate has set completely. 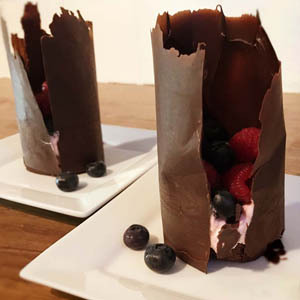 Once the chocolate has set, carefully peel the parchment paper off and transfer each chocolate wrapped tower to a plate and spoon some blueberries and raspberries into the well of the tower. Return the chocolate and raspberry towers to the fridge until you are ready to eat. This is a tasty dessert as it is, but you may wish to try some alternative fruit flavours like mango, black cherry or passionfruit. These flavours would work really well with the dark chocolate casing. Be sure to connect with us on Facebook, Twitter and Instagram to keep up to date with our latest recipes, and food & travel updates.